If there's one thing I really appreciate about Ame-Comi, it's that it's all women (except Batman, whatever). Personal bias, sure, but true nonetheless. You have to feel for the marketing department, though, trying to sell series... what are we up to now, nine or ten now? - and having to delve into the C- and D-listers to find new heroines to fill up the ranks. Luckily (as I think I've noted before, about Mary Marvel or something) comicbooks create most of their heroines by taking a male hero and applying Rule 63 (they were at it long before the internet, too), so there's plenty of leeway to make someone like Jesse Quick (by no means a bad character, but you won't find Warner Brothers clamouring to make a film about her) and adding "as The Flash" to her name on the packaging. Faster Than Lightning! Super-speedster and member of the Flash family of zoomers, Jesse Quick invokes the mysterious 3x2(9y2)4A formula, tapping into the power of the Speed Force. Fleet of foot, Jesse sizzles with swiftness! Before our more nitpicky readers start furiously emailing, yes, we know the formula is supposed to be 3x2(9yZ)4A - whoever was writing the box text mistook a Z for a 2, so furiously email DC Direct instead. Judging by what seems to pass for "on time" over there, they could use a Speed Formula or two. 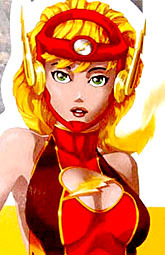 Jesse is a member of the "Flash family," true (although I first met her as Liberty Belle, of the cute pants), but so far as Ame-Comi is concerned, she's the Flash, and the Flash is kind of a big deal, so Jesse's looking a lot flashier (pardon the pun) than usual. Aside from big eyes and small inhibitions, the Ame-Comi influence comes from her eschewing the typical superheroine costume options of tights and/or leotard in favour of a sporty short-shorts bodysuit, but to that the design adds lightning bolts everywhere. They're on her flanks and hips on the suit - and even the panel divisions have slanted corners, to look lightning-like, she's got the Mercury-wing-esque bolts on her shoes (which also have zig-zag toes and soles) and on her helmet thingy, there's the obligatory logo on her chest (and a smaller one on the helmet forehead), and - in quite a cute touch - even her hair has lightning bolt designs worked into it. All those bolts regardless, she's not the most striking of Ame-Girls - indeed I wasn't that blown away by her promo photo, and waited to buy her (or not, depending on how she looked in person) off the shelf, rather than pre-ordering her. Since we're here, of course, you can take it as read that I came around to her look. She's not fancy along the lines of Huntress or Steel, nor instantly eye-catching in the way of Poison Ivy or Wonder Woman v2 (the nearly naked one), but she's sleek, and her pose really shines through, poised on one foot, body slanted back, right arm stretched out, left tensed - it's not a pose in motion, but it does a remarkably good job of suggesting she's a quick-moving character. The limited articulation these statues sometimes get helps the look, with swivel glove tops and neck - it lets you get the angles of the hands just right, and with her looking slightly to her right, she seems to have just paused after a quick sprint. For a sleek design there's a lot of sculpted detail to cover - nothing is just painted, there are sculpted divisions for every costume element on her. On its own merits the sculpt is impressive - not just those lines, but there are also a lot of small but convincing creases in her suit, selling the idea that it is a suit, not just the naked-physique-painted-in-primary-colours that comicbook art gets away with. And suit aside, the smooth lines of her body are actually a lot sexier than you might at first think, comparing her to her more exhibitionistic Ame-Comi sisters. The plunging back shows off a fair bit of skin, sure, but the physique is characterful rather than just visible, with taut hips, slender but firm legs, and restrained (by comic standards) breasts - she's got an athletic quality to her that fits her design. The chest logo is cute too, a separate element stretching across the random cleavage window, leaving the contour of the skin underneath intact. But I did say "on its own merits," because the paint lets Jesse down. Big time. For starters, the suit is glossy, which compared to the matte finish on the promo photo is a poor choice - the edges of the sculpted lines show up too much, ruining the image of a sleek one-piece suit, and the shine makes her look cheap and plasticky, not fancy. The light catching edges also shows up the mold lines, especially on the helmet, where there's some sloppy joining that the paint ought to be concealing, not highlighting. And on top of those, the paintwork is just plain bad. Diamond (bless their mind-numbingly incompetent hearts) managed to send my store a box of Punisher Max issues in place of the majority of the Ame-Comi shipment, so there was only one Jesse to buy - maybe this paintwork is an isolated issue, but I can only review what I've got. And what I've got is poor coverage for the yellow, leaving it faded and murky trying to cover the darker bases, sloppy work on the narrow lines, several areas - left hip and right glove, notably - where the base coat is showing through the second coat, and multiple random splotches of the wrong colour on wrong areas. Honestly - aside from the hair - there's no paintwork on this statue that I'd call worth buying, and if this is the quality point for the line as a whole, the factory needs a damned good spanking. And not the fun kind. The hair is decent - not remarkable, but a fair use of highlighting that brings out the sculpted zig-zags nicely, and complements quite a nice face. I know I often go on about how the facial sculpts on these would be better if they were closer to the art, and I'm doing it again, I prefer the art - but the difference is very slight, a variation in how pursed her lips appear that makes the statue look more surprised than the concept image. But it's really nothing you can't attribute simply to translating a flat image into three dimensions, and Jesse remains a very pretty sprinter. Despite being up on one foot, the flat sole of her shoe means she can stand unaided - she's well-balanced, and unlike some other Ame-Comi women (the aforementioned Wonder Woman v2, for instance, now that she's had time to do it) I don't see Jesse developing an inconvenient lean over time. She'll fall over if you bump the desk though, so the included base is welcome. She also has an optional visor, which fits more or less snugly in the frame of her helmet - more or less, in that if you look closely you can see it's not a perfect match, but unlike the similar visor included with Ame-Comi Star Sapphire, and I imagine discarded by all her owners, it's not noticeable at what'd be a common viewing distance. Jesse's made me worry, rather - her series-mate is Duela Dent, all steampunked up, and if her detail-heavy costume is similarly afflicted with bad paint, she'll be an unholy mess (when Diamond finally gets her here). Upcoming are an armoured Wonder Woman, and Big Barda, whose designs also lend themselves to being vulnerable to poor paintwork more than average. And these things aren't cheap nowadays - even with currencies in a favourable position, the price hikes since the Ame-Comi line began have robbed it of its initial "not bad value, actually" status, and now any less-than-satisfactory release is difficult to forgive. But I'll give Jesse a pass, simply for the sake of the line as a whole - on her own, she's badly let down by production, but her sculpt still has its attractive qualities, and standing among the other Ame-Comi figures, it's enough to make me not regret buying her. That, and I'm going to repaint her costume. Your mileage may vary a great deal if you don't - lenient as I'm feeling overall, I can't say I recommend her as-is.